Find My Workspace lists over 95% of the business centres market in Southampton. Simply click Request Quote to check pricing for one office, or Add to Basket for multiple offices. This centre is based on the outskirts of Southampton, neighbouring a friendly tech company. The centre prides itself on a no frills approach to the workspace, with space being free of clutter and distractions – although tenants can customise their workspace to their heart’s content. The centre offers ultra-flexible terms for prospective tenants. With a dedicated breakout area, complete with comfy seating, tables and stools, allowing you to mix up the atmosphere of your workspace when engaging in different types of work. In addition, the kitchenette area comes with fridges, freezers and microwaves for communal use, calming any lunchtime panic. Tenants can also make use of secure, reliable and fast internet – both wireless and wired – with the centre also holding the privacy of tenant’s usage of utmost importance. The atmosphere of the centre is airy and fresh, with an abundance of natural light and air conditioning when needed. Catering services also supply the offices twice a day, in the morning and afternoon. Although open officially 8am-5pm, the centre is willing to be flexible to allow tenants to adjust their days to their needs. Based just outside of Southampton, this centre offers a great open place space, allowing potential tenants a lot of control over how they design the space and giving the option for bespoke layout solutions. The space totals 1,500sqft split over two even floors. Refurbished in 2012, the centre boasts a modern design with tiled floors, a large meeting room, separate toilet facilities, and kitchen facilities. The centre also benefits from LED lighting, Cat5e cabling throughout and central heating. It is ideal for larger, more established businesses looking for a new home that gives them customisable control and the ability to grow their brand in their own independent space. Other businesses nearby include mortgage advisors, web designers and property developers. This historic business centre offers character offices in the much sought-after Ocean Village Marina. Suites for 2 to 20 people are immediately available for long or short term occupancy. Many of these suites offer spectacular marina views and there is ample parking directly adjacent to the building. For those who are not yet in need of an office, a virtual service with a prestigious Ocean Village address offers the perfect solution. There are bars and restaurants available in the marina together with a cinema, convenience store and coffee shop. 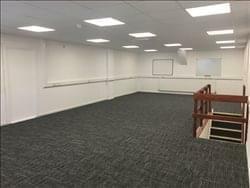 The unbeatable location together with an established and experienced team, providing excellent customer service, makes this an ideal choice for a fully serviced business centre.